Last month was Kedah Perlis, please visit this page to view the round up. I'm hosting Pahang this month. Abbygail couldn't make it due to some unforseen circumstances and being the organizer, it's my responsibility to take over. Luckily few months back before she offered to host Pahang, I had already prepared myself for this by doing quite an amount of reading. Since this introduction was done in a rush, please bear with me with the lack of information. I'll complete the list of recipe links before the 3rd. But before that, you can browse through the Sultanah's recipes available at Pekan Municipal Portal, there's more than 30 recipes available there. Pahang is the largest state in Peninsula Malaysia, and the third in Malaysia after Sabah and Sarawak. Having the top 4 hill top holiday destinations in Malaysia, of which could have been visited by most of us Malaysians, more than once. But even so, how much do we know of its food. Pahang has 11 districts and each of them have their own specialties. But then again.... being the state blessed with the longest river in Peninsula Malaysia , Sungai Pahang and having lots of smaller rivers, fresh water fish is a common sight on the dining tables. Patin is very popular in Pahang and the locals love cooking it with tempoyak, of which is fermented durian. Another popular way of cooking the Patin fish is Masak Lemak Cili Api of which is coconut milk with lots of bird's eye chilli. During my 2 year stay in this state, I have eaten quite a good amount of Patin masak Tempoyak, of which I will try not to take the gravy, but just the fish. And it's when I have learnt to eat Patin fish. ﻿Pahang is also famous for its durian and petai. The locals make use of the excess durian and prepares tempoyak. It is said that when one makes tempoyak, no hands should be used and the durian flesh can only be removed using cutlery. If not, the tempoyak will not ferment properly. Tempoyak is an acquired taste, of which needs more 'training' compared to fresh durian. Personally, I can't stand tempoyak. LOL. But I'm a durian lover. They use tempoyak to cook fish, cook petai, or just eat it with rice as a condiment. My friend used to teach me to eat tempoyak with jering (a cousin of petai) and it tasted good, but the end result wasn't pleasant. I hugged the toilet the whole night because my stomach was growling and growling due to flatulence. This is just a personal experience, there are many who have eaten and had no problems with it. Besides fermenting durian, one shop in Karak have found new ways to use this king of fruits. 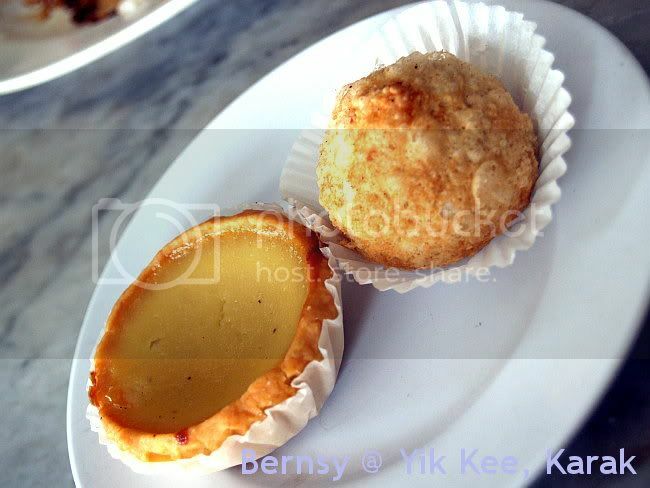 Yik Kee is famous for durian pastries. From durian tarts, to durian bomb and durian cake, it's one of the reasons that people stop by this small town while being on their way along Karak Highway. Although durian pastries are in a lot of places, Yik Kee has been doing this for a long long time as I have tasted their durian egg tarts more than 15 years ago. Nowadays they have come up with more durian products like durian pancakes and durian soft serve ice cream. There are also a lot of rubber estates in Pahang. And rubber trees is not only for producing latex. It is also used as a food source. The seeds of the rubber tree is used to make asam rong. The fallen seeds of the the rubber tree is collected, shelled and dried in the sun. Then they are pounded and lastly fermented to make Asam Rong. Asam rong is used like a seasoning. It can be used to cook fish, Gulai Asam Rong, or it can be used to cook vegetables. A note of caution for overindulgence, it can cause bloody stools. 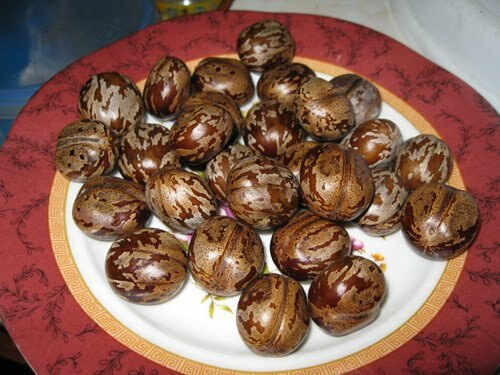 (Source: Wikipedia) Visit this blog to see how it's done with another seed, buah perah. ﻿Durian, tempoyak, petai, rubber seeds, might not be acceptable to some, but there are also the palate friendly food. Foods that doesn't need an acquired taste. Cameron Highlands is a district accessible via the state of Perak. I've been to Cameron Highlands countless times because my hometown is quite near this place. sometimes not many even realise the Camerons belongs to Pahang, LOL. Even the phone code is 05, and that belongs to Perak. Camerons is the prime food production area, producing most of Malaysia's vegetables. 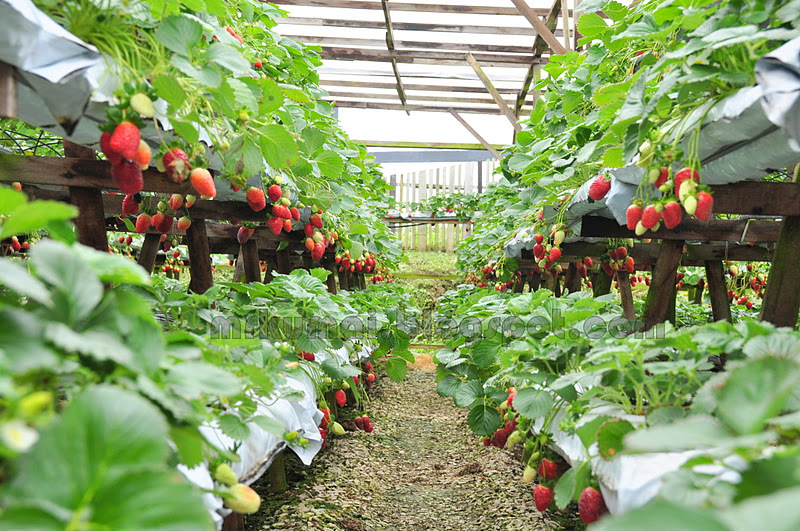 With a cool climate all year round, it is also suitable for flower production as well as temperate fruits such as strawberries. 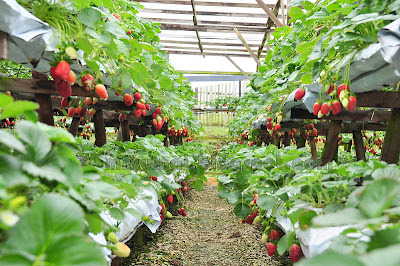 If you were to visit Camerons, you'd see strawberry farms everywhere, inviting you in for self picking session. Lots of snack and desserts are made with strawberries and sold there. If one were to walk at the Brinchang night market, you will see lots of stalls selling strawberries and strawberry products. Besides strawberries, most cafes in Cameron Highlands do have scones on their menu. I wonder why. Is it because it's cold that one will want a cup of hot tea with scones, and oh yes with locally produced strawberry jam too! British cuisine is also offered at some hotels like The Smokehouse and Cameron Highland Resort. 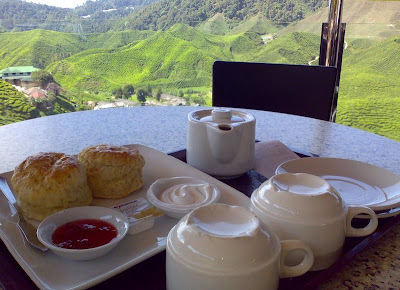 While typing this, I do miss the mushroom pie and scones from Cameron Highlands Resort, LOL. Scones at a Bharat Tea Plantation. Although steam boat is extremely popular in Camerons, I'm sorry but I can't accept that. I wonder if you remember this dish? This is a Guangxi dish and Bentong and Raub has a huge population of Guangxi Chinese there. One of the largest in Malaysia, probably? The Guangxis love their taro pork belly (芋头扣肉) and Steamed Chicken with Nham (pronounced with a heavy nasal tone). And for this month, come try and cook some Guangxi classics. Pahang is also blessed with a Tengku Puan who loves to cook and she has a cookbook to her name. She is the wife of the prince next in line. Pekan Portal has included a few of her recipes for public use. 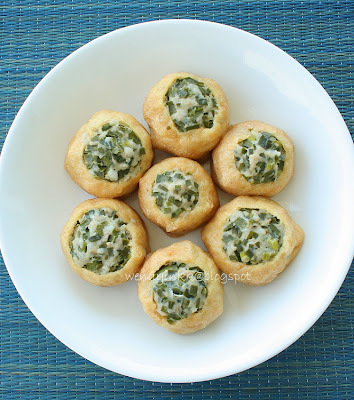 You can visit this site and retrieve quite a good sum of Pahang recipes. Here's the link to the Tengku Puan's recipes (more links on the left panel of the site) to get more of Pekan's recipe, you can hover over to the link bar and click on info Pekan, the last item 'Resepi Makanan Daerah Pekan" will provide you with more district recipes, all from the Tengku Puan's cookbook. For a summary of the dishes according to district, please visit here. Kuih General Mahbob - almost like a solid kaya, like a steamed coconut custard and topped with coconut milk remnants. Taro Pork Belly - Recipe in Chinese from a Guangxi source, you can use an online translator. I've eaten this before because it's a festive dish at my maternal grand's. and don't forget Pekan's Municipal Portal with more than 30 recipes available! Remember, the aim of this event is that you try cooking food from the state. Just any. You need not cook something that no one else has done. 1. Who can join? Anyone can join. Come let's replicate some Pahang food at home! 2. Prepare a dish ( sweet or savoury ) that is from Pahang state, be it old time favourite, modern goodies or dishes that has been localized. Take a picture of the food or many pictures. If possible, tell us the story about the dish, share with everybody so that others will learn. Please read FAQ on what make the dish a localized dish. 3. Provide a recipe that is credited ( from books, internet, friends or family or maybe it's your own, be specific). Submissions without stating recipe sources will not be accepted for all forms of submission. 4.Submit your entry latest by 31 December 2012 except for Facebook submissions.
" I am submitting this post to Malaysian Food Fest (link to MFF page), Pahang Month hosted by WendyinKK of Table for 2..... or More (Link to this post) "
Bloggers can submit old recipes to Facebook. Anyone that has once cooked a Pahang dish and have a picture and recipe can submit to Facebook. Not necessarily a recently done dish. A Round Up will be done for all blog entries and emailed in entries on January 01, 2013. Facebook entries are not included in the round up. i have also never eaten tempoyak but i've seen them selling in wet market. I think it's tempoyak! haha!i want to go and chk out some durian desserts now! 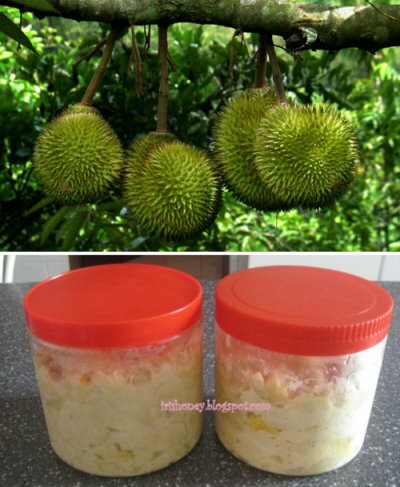 Eeee fermented durians! I don't think I'll enjoy that. Lol! Another difficult state to do...at least it is for me! I love curries and spicy food but just not good at cooking them! Have been a silent reader all these while and I have tried your butter cake recipe. Marvellous. Thank you for telling me, I'll correct it right away. Online Magazine Giveaway for 10 winners!